Step 1: Get to know your Social Security — You and Social Security are on a journey for life, but there is so much you may not know about the benefits and services we provide. Social Security delivers financial security to millions of children and adults before retirement; including the chronically ill, children of deceased parents, and wounded warriors. Step 2: Verify your earnings — Your benefits are calculated using your employment records. You can use your personal my Social Security account to verify that your earnings are recorded accurately. Step 3: Estimate your benefits — With our Retirement Estimator, you can estimate your future retirement or disability benefits based on your actual earnings record. This can be invaluable as you plan for your future. Step 4: Apply for benefits — You can apply for retirement, Medicare, or disability benefits online through our easy to use, convenient to navigate, and secure online application. Step 5: Manage your benefits — Social Security puts you in control by offering convenient and secure services that fit your needs. Verify your earnings and payment information, change your address or phone number, get a benefit verification letter, and even start or change direct deposit of your benefits. A personal my Social Security account is the key to helping you plan for your financial future. If you don’t have a my Social Security account, open yours today! 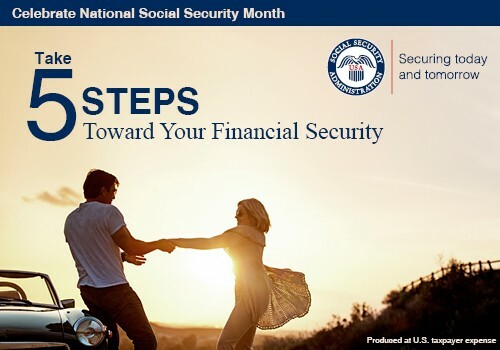 Take 5 Steps toward Your Financial Security and get to know your Social Security and the many ways we help secure today and tomorrow for you and your family. This entry was posted in National Social Security Month, Online Services and tagged apply for benefits, apply online, benefit verification letter, manage benefits, My Social Security, my social security account, my SSA, NSSM, Retirement Estimator, Social Security account, Social Security benefits, verify earnings by Jim Borland, Acting Deputy Commissioner for Communications. Bookmark the permalink. I want to make sure my social security number is fine and the information is actualized. How do I do this? Let me assure you that your SS is fine and actualized. And by what authority do you answer for Social Security ? Please be aware that our official agency responses will always include the Social Security Administration (SSA) seal, and that we have an official social media team dedicated to posting messages and responses to customer inquiries or comments that specifically address SSA issues. Thank you for your support and for using our blog. We apologize for any inconvenience Cameron. Unfortunately, but for security reasons, we do not have access to personal records in this blog. Please continue working with your local office. You can request to speak with the manager to see how we can help to expedite resolution of your situation. If you are unable to visit the local office, you can call our toll free number at 1-800-772-1213. Representatives are available Monday through Friday, between 7 a.m. and 7 p.m.
Just a reminder – Please be cautious about posting personal information on social media, Thanks. Please be aware that our official agency responses will always include the Social Security Administration (SSA) seal, and that we have an official social media team dedicated to posting messages and responses to customer inquiries or comments that specifically address SSA issues. Thanks! Jim’s not available, why don’t you check in with Social Security? another thing you can do is contact your FEDERAL SENATOR / HOUSE REP asking them to check the status for you. DDS has to provide them MONTHLY updates what the status is on those they are inquiring for their constituents!! this way you find out how well your federal senator / house rep ARE representing & hearing you when YOU need help!! call your local ss office; they are able to track this too. took 5 yrs. of hell doing redundant paperwork on 2 apps to be approved since my lawyer quit me 4 yrs. into this and DDS / ADMIN LAW JUDGE’S office DID NOT provide my lawyer with a copy of the hearing tape per his / my requests!! because dds/alj didn’t provide this, lawyer DIDN’T send a BRIEF to appeals council. so after 2.5 yrs. of sitting there BEFORE anyone would look at my case, appeals council did NOT have to look thru or read my 2″ file!! they just read alj’s DENIAL & agreed!! so make sure you get HEARING TAPES from alj’s offices everyone!!!! my approval would have gone back 3 yrs. PRIOR to 2nd claim being approved. also after being approved, when you turn OFFICIAL retirement age, you will receive SAME $$ as when being disabled! I want to know if my SS check will increase, I took early SS @ age 62, I work part time & pay SS taxes My part time income last year was approximately $16,000. I have worked part time since starting to receive SS. Thanking you in advance. James. It might increase. Each year the SSA does a recomp of benefits in October for those who are retired and working. If you earn over the amount allowed for the year you could also be overpaid. You need to file the annual report with SS by April 15th. Do not confuse this with the income tax requirement. When you file the AR it would speed up your recomp also. Thank you for your question James. Generally, we use the highest years of earnings to calculate your monthly benefit amount. The amount of your Social Security benefit will depend on the amount of your average lifetime earnings. Each year we review the records for all working Social Security recipients. If your earnings for the prior year are higher than one of the years we used to compute your retirement benefit, we will recalculate your benefit amount. We will send a letter explaining any increase in your benefit amount. We hope this information helps. I would like to open up a “my social security account” but how do I do this? Please send response to my email address. Thk u. Personal ID info is not allowed on this site. otherwise, why ask the question?? We do not have access to personal information, therefore, we do not do direct messaging in this venue. Thanks. The fastest way to establish “my SS account”, is go to your nearest SS Office, and request authentication assist. The will assist. Great idea Teresa, to create your personal my Social Security account just click here. Is there benefits for a spouse if you have been married for over 10 years I was told there are benefits if you have been married for 10 years or more? Yes, once she’s 62 or older. PROVIDING they make more money than what you make!! that’s what i ran into when my dear hubby died 2.5 yrs. ago. since i was on ssdisability benefits, i made more than he did/month. excuse me, i was thinking DISABILITY money…..
i don’t know if that would apply to divorced after 10 yrs. of marriage; my apologies. contact you SS Office, if your situation is different than just age related. Hi Steve. Even if they have never worked under Social Security, your spouse may be able to get benefits if they are at least 62 years of age and you are receiving or eligible for retirement or disability benefits. See our Retirement Planner: Benefits For Your Spouse for more information. You people seeking personal replies would do better going to their local social security office. Secure an appointment to talk with someone there. You are not going to get personal replies here. They do occasionally answer general questions about their systems, but that is all. Excellent to note this but some will continue to ask about their specific situation and there is no way to address those concerns here. Reply: contact your SS Office to establish your account, then can communicate directly. Easy solution to both ! This site should be taken down, another form of waste in our government. Seriously?–you are not in touch with reality. Thank you for your comment Susan. You’re right, for security reasons, we do not have access to personal records in this forum. Our blog — Social Security Matters — gives readers information about a variety of topics, including our programs, online services, current events, and human-interest stories, usually in greater detail than typically shared on our other social media platforms. Our blog encourages discussion and offers important retirement and disability-related solutions. If you have specific questions about your claim or situation, contact your local Social Security office or call our toll free number at 1-800-772-1213. Representatives at our toll free number are available Monday through Friday, between 7 a.m. and 7 p.m. Thank you for your support and for using our blog. Hi Samuel. For working beneficiaries, and after they reach their full retirement age, we recalculate their benefit amount to give them credit for any months in which they did not receive a benefit because of their earnings. We will send them a letter telling them about any increase in their benefit amount. Please call our toll free number at 1-800-772-1213, Monday through Friday, between 7 a.m. and 7 p.m. for further assistance. Thanks. Regarding the reply re local office visits. I have visited my local office with duperb results. Friendly, respectful and one person was from my home town. I received full attention eith no “hurrying me along,”. I recommend it highly. Thanks for your comment Joseph! Social Security is committed to providing world-class customer service today and in the years to come. I have a question, my husband and I are both 62 I would like to recive my early benfit but. It is much less than my husbands must he retire before i can recevie half of his? Or can he continue to work then when I turn 66 can I begin to receive half of his benefit. Thank you for your question Kathleen. You may be able to get spouse’s retirement benefits if you are at least 62 years of age and your spouse is receiving retirement or disability benefits. Your full spouse’s benefit could be up to one-half the amount your spouse is entitled to receive at their full retirement age. However, if you qualify and apply for your own retirement benefits and for benefits as a spouse, we always pay your own benefits first. If your benefits as a spouse are higher than your own retirement benefits, you will get a combination of benefits equaling the higher spouse benefit. Also, if your birthday is January 2, 1954 or later, the option to take only one benefit at full retirement age no longer exists. If you file for one benefit, you will be effectively filing for all retirement or spousal benefits. Please call our toll free number at 1-800-772-1213 for further assistance. Representatives are available Monday through Friday, between 7 a.m. and 7 p.m. You will generally have a shorter wait time if you call later in the week. Hi Jo. Your spouse’s benefit can be equal to one-half of your ex-spouse’s full retirement amount, only if you start receiving benefits at your full retirement age. If a person begins to receive benefits at age 62 or prior to their full retirement age, their benefits are reduced. The reduction factors are permanently applied to all of the benefits the person may qualify for. The best way to start planning for your future is by creating a my Social Security account online. With my Social Security, you can verify your earnings, get your Social Security Statement, and much more. Also, we have a variety of benefit-calculators to help you plan for the future. Hope this helps! When are you going to send me my benefits UNPAID since last July 2016! Hi Anthony. Unfortunately, but for security reasons, we do not have access to personal records in this blog. Please continue working with your local office. If you are unable to visit the local office, you can call our toll free number at 1-800-772-1213, representatives are available Monday through Friday between 7 a.m. and 7 p.m. Thanks. We were married over ten years before divorcing. Neither remarried. His social security is higher than mine by $700. SS said I could not file on his because I make over half of what he makes. Said I can refile if and when he dies. I do not understand. Help please. If I begin to draw social security at a 62.5 how much income can I make at another job. Hi Pat! For 2018, the annual earning’s limit for individuals younger than full retirement age is $17,040. See our Benefits Planner: Getting Benefits While Working for complete information. Would like to request a handbook on Social Security thru the mail. If possible my address: 115 Emory Lane, Dublin,Ga. 31021. If I retire at 62 but don’t take my social security benefit til age 66, 8 months how do I calculate my benefits. Hi Suzanne, our Retirement Estimator is exactly the calculator you are looking for! It gives you future estimates of your monthly Social Security benefits based on your actual Social Security earnings record. We suggest that you create a my Social Security account. With your personal my Social Security account, you can verify your earnings, get your Social Security Statement, and much more. In April we celebrate “National Social Security Month“, see what you can do online at http://www.SocialSecurity.gov. Happy planning! Hello Monique, if you need proof you get Social Security benefits, Supplemental Security (SSI) Income or Medicare, you can request a benefit verification letter online by using your personal my Social Security account.